Xiaomi might be most famous for their Mi range of phones and the MIUI user interface that sits on them, but they also have a number of other products on sale. We've previously raved about the Piston headphones and now we've got our hands on the Xiao Yi 'small ants' Smart camera, a home IP camera that's available for import for just £20 (and that's for the deluxe model!). Is this another Xiaomi triumph or a bargain too far? Read on to find out! Two models of the camera are available, with and without IR night vision, but to be honest, you should probably go for the better version, which is what I have here. 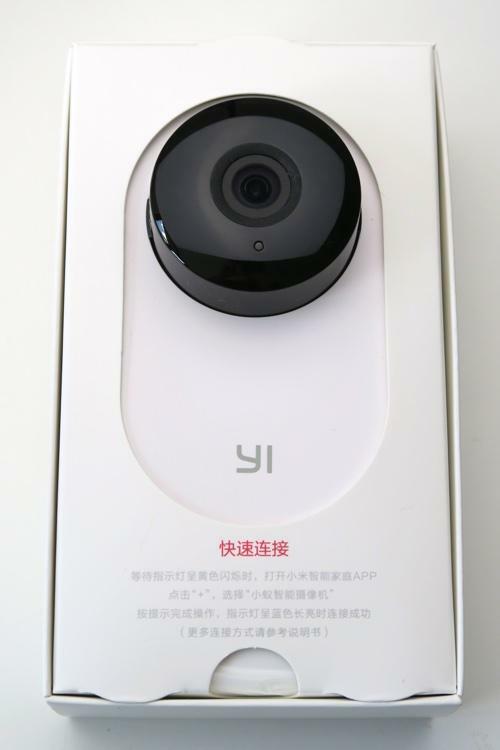 The camera is available from a host of sellers on AliExpress (where this one was purchased), but is also available from the GearBest EU warehouse, priced at £21.67 including delivery. In the beautifully presented box you'll find the camera, a 2m white microUSB cable and a 1A mains charger (with US charging pins - an adaptor was provided by my seller), although the device never pulls more than 0.5A even when the IR LEDs are illuminated (it'd probably run well from a battery bank if needed). The camera is mounted such that the (rubberised) base can be used as a stand or as a wall mount. 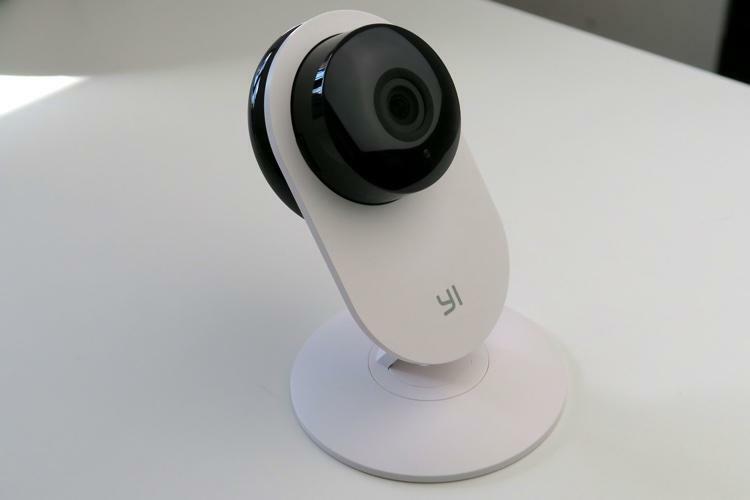 The camera itself has a speaker, microphone, microSD slot for local video storage and (on the night vision version) 8 x 940nm (invisible to humans and pets) IR LEDs around the 1280x720, F2.0, with 111° all-glass wide-angle lens (92.7° horizontal, 48.7° vertical coverage). A reset hole can be found on the back to restore the device to factory defaults. The camera runs on the Hi3518 chipset and supports adaptive rate streaming. Pretty simple eh? 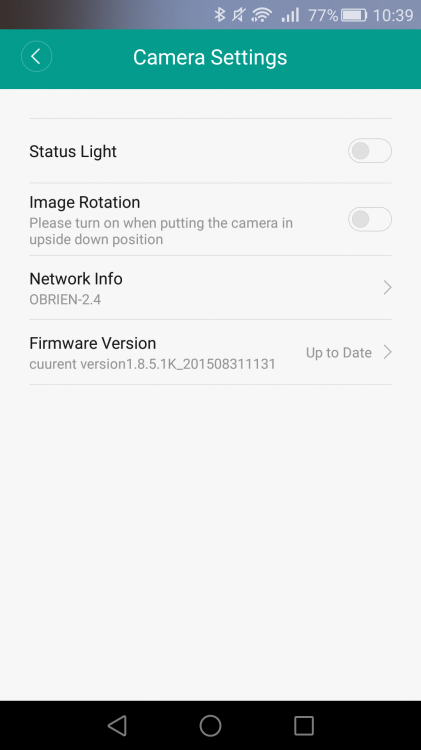 The first time you connect you will likely be prompted to update the firmware on the camera, this is a quick and automated process. As linked above, the camera application is a manual APK install and isn't available from the Play Store. It's not a big issue though as the application self-updates, so you will always have the latest version. As you can see, it's a pretty fully featured app, but it still remains intuitive and easy to use. The only notable omissions for me are detection zone configuration for the motion detection, the ability to configure a time zone and an option to disable the IR LEDS - the fact this is missing means it's not possible to use the camera at night in front of a window, due to reflections. Watching video from the camera is very easy, provided you are on your phone. The application supports SD, HD and Automatic stream qualities either in a window or in landscape full screen mode. When viewing the stream, date, time and data rate are displayed. Below the screen sits a timeline, which has motion events indicated by coloured bars. You can scroll the timeline to view those events. 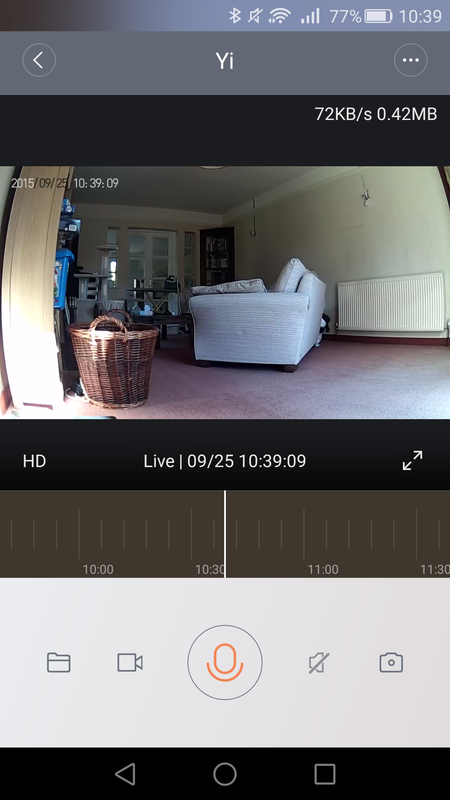 From the stream view you can record video (locally), take a still image (locally), enable / disable sound and even press a microphone button to talk to the remote location using the speaker built in to the device. It all works very well. If you are NOT on your phone, things are more tricky - there is no PC based viewer, unless you use the hacks below to enable the RTSP stream. If you do enable RTSP, they are unsecured, so you probably don't want to expose these outside of your home network! I connect to the camera using RTSP from VLC and it works fine - for viewing outside of my home network and not on my phone, I have my router set up to receive VPN connections, which effectively puts me onto the internal home network. Not an ideal solution however. Because of the wide angle of view, the image does have some 'fish eye' affect at the edges - I wonder if this could / should be removed in software. It's not a huge problem though. The camera has motion detection software built in - when enabled, a motion event will trigger recording to the microSD card inserted into the device (not supplied). It will also trigger a push alert to your mobile device (the popup appears in Chinese, but that does't really matter). You can then launch the app, watch the motion event footage remotely, and even 'record it' to your local device if required. 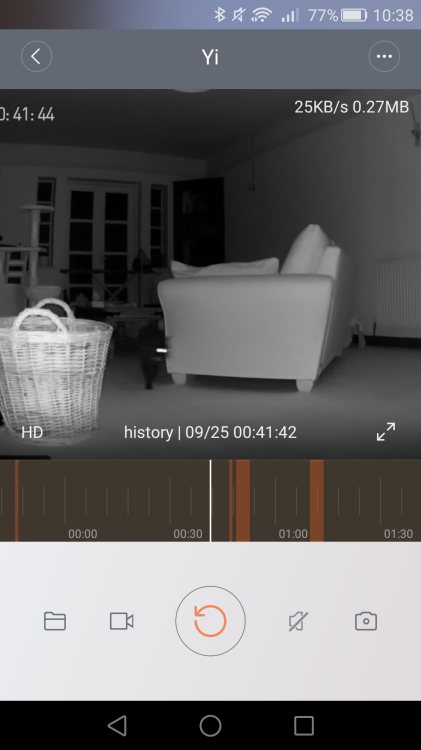 This isn't necessarily an ideal solution if you want to use the camera for home security purposes of course, as if someone steals the camera, they have then stolen the footage too. If you have a Xiaomi router in your home, you can use that as remote NAS storage for the camera, mitigating that problem a little (and hey, Xiaomi routers are super-cheap too). The 8 IR LEDs on the camera are arrange in a circular layout around the camera in such a way as to distribute light across the whole viewable area. The net result? They work very well (with the aforementioned caveat that it's unfortunate you can't turn them off if needed). The switching process is completely automatic and in my experience so far, the software seems to get the cut-over point just right. Out of the box the camera is configured to the Beijing time zone and there is no option to change this in the software. A bit annoying! Instead you need to use the hack below to specify an alternate time zone, as a differential to the default. A bit of a nuisance, but at least you can change it. 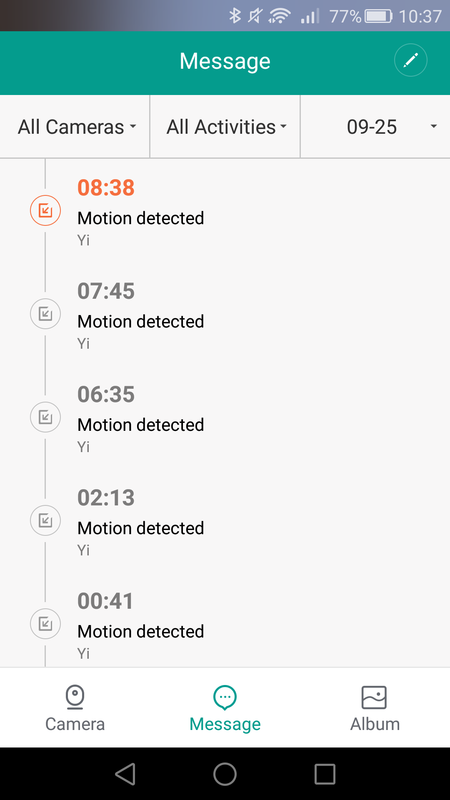 Until you do, the app gets very confused scrolling through the motion detection timeline. 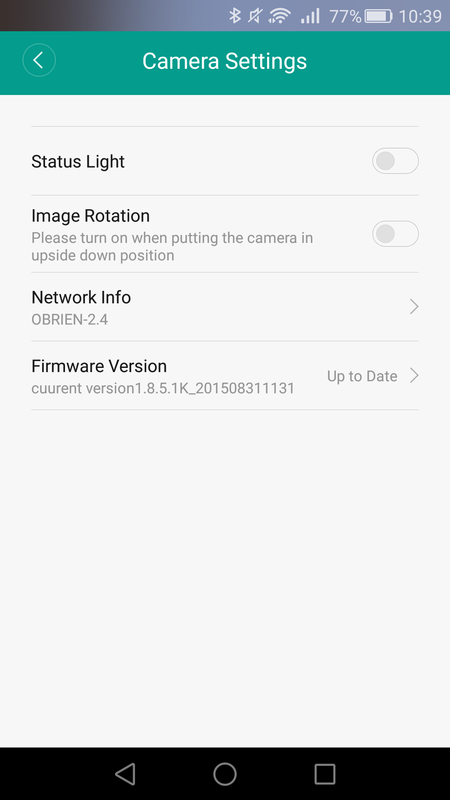 Strangely, there were some features in early versions of the camera firmware that didn't make it to the latest releases - HTTP access (including browser access to the SD card), RTSP streams, telnet access to the underlying Linux OS and FTP access. There's also that one major missing feature - the ability to set the timezone. Thankfully, you can hack all these features back in, really easily! ...as well as telnet and FTP access with the credentials root / 1234qwer (the password can be changed using the passwd command). With a cron script on a server hooking up to the camera via FTP, this could provide an alternative method for storing video away from the microSD card. The Xiao Yi 'small ants' camera is a great little camera. It's probably not going to be the center-piece of an advanced home security system, but for keeping an eye on things when you're not in the same room / house, it works well. 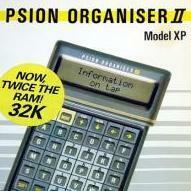 It would be harder to recommend were it more pricey due to its few quirks, but at £20 it's a positive steal. Add in the fact that it's also a rather nice looking piece of tech and it's a great buy. Recommended. What is the image quality like if pointed outside through a window at night? Terrible - you'll just get the reflection of the IR LEDs. When wall mounted, is there enough clearance to rotate the cam left/right whilst keeping it vertical? Not ideal for mounting on a wall and trying to capture a wide angle then! :( Suppose you could mount it to a 45° cut block of wood and mount that up in a corner tho. Could it be used outside? Is it water or weather proof? I'm unable to log into the app. 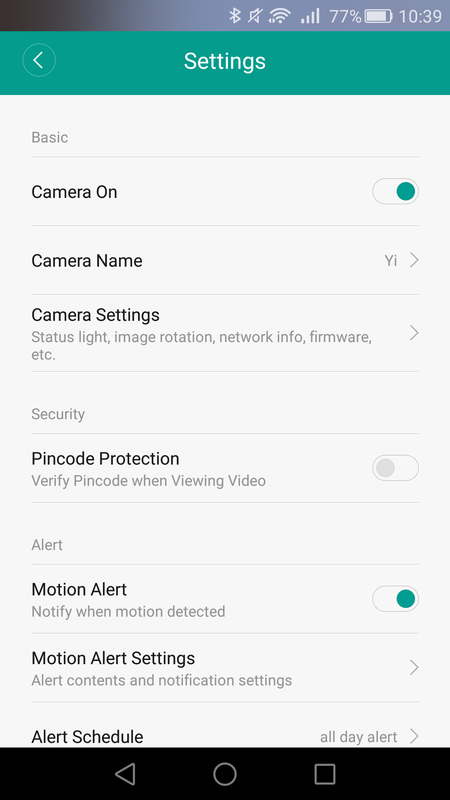 I just get a spinning circle after permitting the camera access my mi account. Anyone else having similar issues? I am getting the same problem currently @theShire hopefully it is just a temporary issue with the server. I'll try again in the morning..
You mentioned Tinycam in your cons list - did you mean it doesn't work with Tinycam at all? I can live without password protection but would need Tinycam to work. I've tried both QR and normal options on both Android and iPhone. Nothing happens, just a flashing orange light on the front. Mine arrived today. I can login to the app ok (had a Xiaomi account already in case that helped). 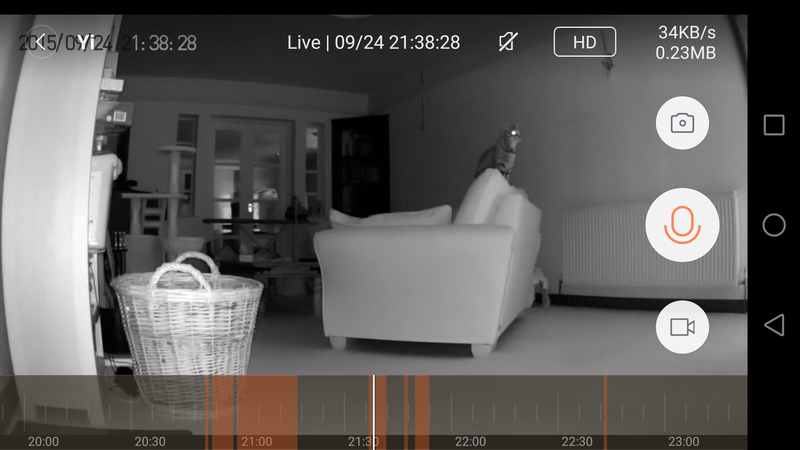 i managed to set up the camera using the app on my hudl this evening. Slightly awkward with the Chinese voice prompts but managed it in the end. Once setup properly with the tablet I was able to use the app on multiple phones and the same xiaomi account instantly. 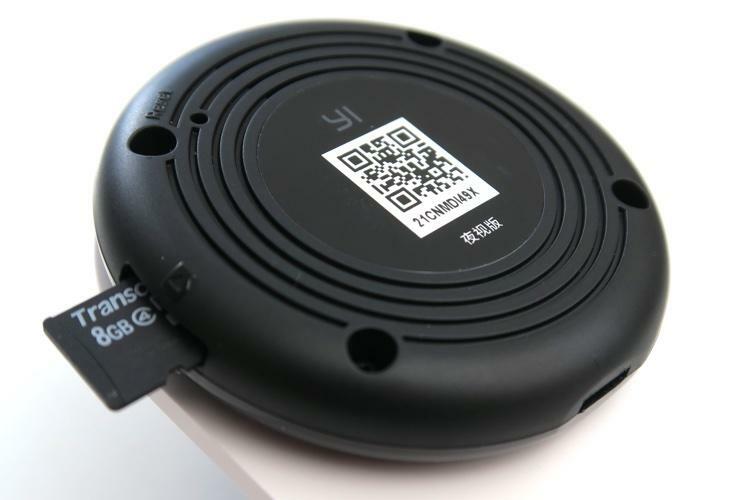 Camera refuses to read QR code, don't understand Chinese and with no option of a good old fashioned network configuration via a cable camera is a complete waste of money. Update, got it working now. Didn't need the QR method, just entered the Wi-Fi password and was away. Got the camera to work. I would like to hear if somebody has the same experience with the app. I find it almost impossible to selectively watch past footage. When I scroll back to a specific time it never starts playing from this moment. It always starts from some other place hours before that. It feels like it always wants to show me the video from the beginning of this same day that is marked as "unwatched" or something... 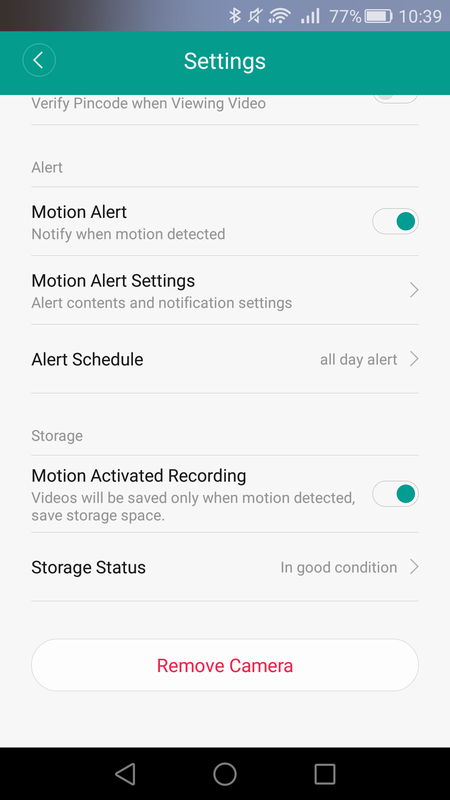 So if I have multiple movement alerts in a day, I can't watch the last one until I sit and watch all of them. No, not at all, bought with my own money and I think it's awesome! Im trying to set the time error on the camera. I've altered the equip_test.sh file to GMT+5 and altered the version number. 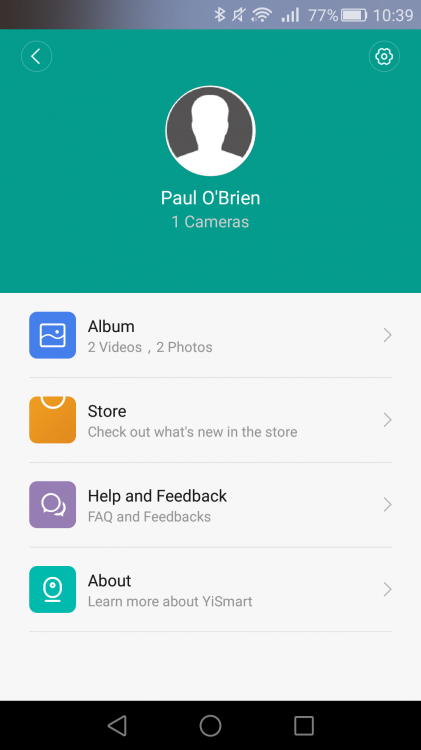 Do I now just place the 'test' folder in the root of the SD card? There is a 'home' file in the downloaded archive, does this need to replace the home file already in the SD card? Then just put the SD card back in the cam and boot. Is this correct? One final question, I have the none IR version of the camera. Will the above method work for my camera also? Anyone done the above and got it to work? The timeline fault is driving me crazy. Just not sure which files exactly to swap. Wipe the SD card and put everything from the zip on it! It works on both versions of the camera AFAIK.